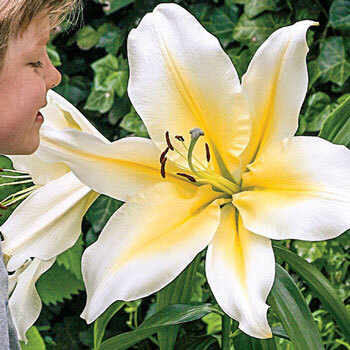 "Big Brother" does not disappoint, growing up to 6' tall on a sturdy stem with fragrant outward-facing, pale yellow blooms. This lily has the largest flowers yet! 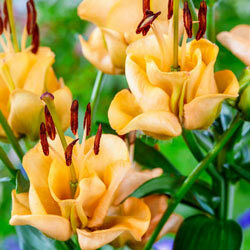 Use the cut blooms and glossy, green foliage for a fragrant bouquet! Blooms will increase in size and beauty year after year! Limited Supply. Planting Instructions: Plant 4 - 6" deep because lily bulbs develop roots along the stem just above the bulb. Mulch is beneficial to keep soil moist and cool. Winter Care: Provide a layer of mulch for winter protection.